If you are a sleeper who prefers thick, extra firm pillows, then the Envirosleep ® Dream Surrender Firm Pillow might be the perfect fit. This pillow has been found at many Hampton Inn ® Hotels to cater to their guests' needs. 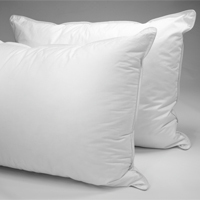 This pillow is perfect for side sleepers and sleepers with wider shoulder widths. Try this pillow today, and get the support you need!